This summit was originally planned to be part of a 2-summit trip along with Wasno Ridge. After forgetting one of my water bottles, that trip turned into a single-summit trip (it was a hot day!). I wanted to come back and get Willson Peak, and also get some more WWFF/POTA contacts for Henry W. Coe State Park. So this return trip was made. And what a great morning for a run! I got to the trailhead just about on time, which is somewhat unusual for me for this early of a start (0600) and a long drive (1 hour). There were no other cars parked at the end of the road when I got there. See my Wasno Ridge post for more info about this parking area. This run/hike starts out in the same place as the Wasno Ridge route, with a brief jaunt along the creek, then a turn up the hill. There are several junctions along the way, and on some, it’s important to choose the right one. But trail signage for “Willson Camp” seems to keep one on the right track. On the less-steep and the flat sections, I was able to run, so this climb went by pretty quickly. Going up this ridge, there are a couple of trails that’ll get you to the same place: “Spike Jones” and “Timm.” I took the Timm trail, even though it looked slightly longer than Spike Jones. A little ways up the hill, there’s a junction where you get to choose, with a little wood board sitting on the ground saying which is which. A little further up Timm trail, there’s another junction that’ll get you to the same place, no matter your choice. To the right, it looks like some recently-built switchbacks to bypass a steep section of the trail. I chose the steep section. 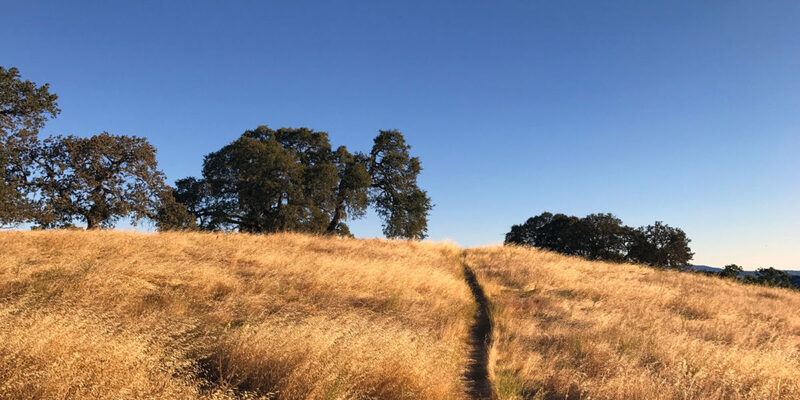 When you get to where the Spike Jones trail meets back up with Timm trail, you’ll be rewarded with your first views to the southwest, and you can almost see Santa Clara Valley over the hills. Usually, when I encounter wildlife on my runs or hikes, they’re spooked and gone before I can grab my phone to take a picture. This time, however, I ran across a couple of bucks that made a point of not showing they were afraid of me. Great for pictures! Two bucks – still full velvet on their antlers! Moving on up the trail, the views really open up, and the grass gets taller. The trail has enough grass around it to brush against your legs as you hike, but not so much that it feels you’re wading through it. Not much later comes another junction, this time an important one—I think if you went right instead of left on this one, you’d head down to the Hunting Hollow entrance of the park. Soon after that junction you’ll see another of the “Willson Camp” signs, so you’ll know you’re going the right way. After a series of switchbacks, you meet up with Steer Ridge Road. Now you’re high enough to see over into the valley below. After climbing a bit more, you’ll see Wasno Ridge (W6/NC-174) off to the north. The road follows the ridge, going up and down for a while (overall up) through some trees. The time of day I was doing this, I got to see the rising sun through the trees—pretty magical. Keep following the double-track and you’ll come to the final junction—turning left to head to the summit. Arriving at the summit, the survey markers (yes, there were two) were very obvious. Don’t think anyone will be able to steal this one! Taking a quick look around, I found a good tree for throwing up my end-fed antenna wire. Up to this point, I had managed not to wade through tall grass. Getting to the tree and setting up the antenna, wading through the grass is all I did. I quickly managed quite a collection of burrs on my running gaiters and a little bit on my legs. Ugh! Not wanting to waste time getting the “perfect” antenna setup, I chose a branch about 20 feet up, making it an easy throw with my water bottle tied to the end. One throw and I was in business. I tied the end of the paracord off, and walked the 61 feet of wire out through the tall grass. I found a somewhat sturdy part of the grass to set down. I propped the feed end of the wire up off the ground a bit using my 5.4m squid pole set up so it kept the wire a couple of feet off the ground before going into my matching unit. After getting all of this set up, I was happy that I had a south-facing sloper antenna, but as I operated, the realization dawned on me that I was on the wrong side of the summit for good easterly radiation—I was on the west side of the summit, with it gently sloping up to the east from my antenna. I was probably throwing most of my signal southwest. With enough experience (you think I’d be experienced after 20+ summits), this will come without thinking. For now, I’ll have to try to think a little bit more. Next time I do this summit, I’ll try to find a tree on the east side of the summit, and perhaps even find a place where I don’t have to operate in the tall grass. I chose to operate standing up, to reduce the chance of critters getting where they shouldn’t be on me. Using the network cable for the mic, in place of the stock cable, I’m able to stand up and operate if necessary. Pretty convenient! I had pretty decent cell service, so I was able to self-spot for POTA and SOTA. I started out on 40 meters. As usual with 40 meters in the morning, I had to manage both QSB (fading) and QRM (interference). Nonetheless, I got 6 contacts in about 15-20 minutes. . Then I switched over to 20 meters. Here there was major QSB, but it worked anyway, for another 4 contacts. I try to give everyone a fair chance at contacting me by keeping the frequency alive with CQ’s for a while after answers dwindle. Before leaving, I gave 2 meters a quick try. I was able to hear a couple of stations that I recognized, but they couldn’t hear me. I hopped onto a known high-level repeater and contacted one of them to thank him for listening for me. As expected, we didn’t have good line-of-sight coverage to the northern part of Santa Clara Valley. I enjoyed the time in between QSOs—the air was just the right temperature, with a light breeze. A very peaceful morning. After about an hour of being on the summit, I packed it up and went back down the way I came. Most of the route isn’t too steep, so I was able to run most of the way back.